Home Articles Carbon Dating: How old is it really? Radiocarbon dating is not employed to test theories, but to support them . . .
radiocarbon always gives a scattered set of dates. The theorists then pick the ones they believe to be correct. Radiocarbon dating has been one of the most significant discoveries in 20th century science. Renfrew (1973) called it “the radiocarbon revolution”…. Desmond Clark (1979) wrote that were it not for radiocarbon dating, “we would still be foundering in a sea of imprecisions sometime bred of inspired guesswork but more often of imaginative speculation”. . . . Failing to acknowledge this lack of precision, a Nova program that aired in 2009 showed a paleontologist who had found a skeleton of an extinct animal deep in a cave. The narrator indicated that they have samples dated “because they want to know exactly how old the skeleton is.”8 Sorry—but the scientific dating methods are tools for estimating ages—not determining them exactly. A famous American colleague, Professor Brew, briefly summarized a common attitude among archaeologists. . . .
Carbon-14 is radioactive—therefore, it decays over time. It can be used as a dating tool because creatures and plants accumulate it during their lifetimes, and cease doing so when they die. The system is conceptually very simple. If four essential facts are known, an age can be calculated with precision. 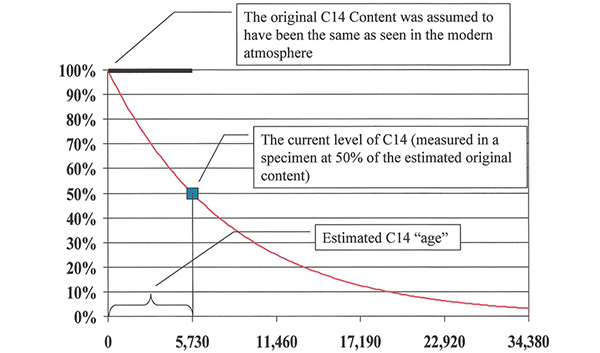 They are: (1) the C14 concentration in a specimen at its time of death; (2) the decay rate of C14; (3) the current C14 concentration in the specimen being “dated”; and (4) if anything else has affected the specimen’s C14 content. Note: only the third of those four necessary facts can be measured, the other three must be estimated, assumed, or extrapolated. Figure 1. Radioactive decay of C14. The curved line represents the declining amount of C14 atoms over time due to radioactive decay. During each half-life (~5,730 years), about half of the remaining C14 atoms in a specimen are expected to decay. Radioactive decay causes once-living specimens to lose half of their C14 atoms in about each 5,730-year half-life. Thus, if the level today is half of what it was estimated to be when the thing died, it is said to be 5,730 years old. If its current level is only one quarter of the original estimate, 11,460 years old, and so on. See Figure 1. Since scientists aren’t able to take sophisticated equipment back in time to actually measure the C14 concentration when a plant or animal died, it is necessary to estimate. It was natural for Willard Libby, the inventor of the method, to assume uniformity in this estimation.11 No doubt, he had been taught it from his youth, and he reasoned that living things in the past must have had the same C14 levels as seen in living things in modern times. Therefore, he used modern C14 levels to approximate the ancient.12 This is graphically represented in Figure 2. Figure 2. Estimated years since a specimen died based on how much C14 was believed to have decayed since the death of the specimen. 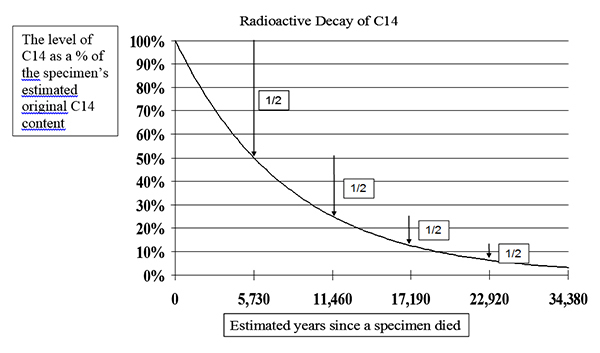 The curved line represents the loss of C14 over time due to radioactive decay. The bold line at the 100% level represents the generally accepted assumption that for thousands of years the original content has been at the same level as what is observed in the atmosphere in modern times. The small box on the decay curve represents the current level of a particular once-living specimen, in this instance measured at 50% of its assumed original content. The technique suggests that the specimen died about 5,730 years ago (one half-life). Supernova 1987-A was studied carefully by scientists. It was the first exploded star close enough to Earth and large enough for detailed analysis—made possible by the emplacement of modern neutrino-detection equipment. Roland Pease reported that it was the only supernova that could be seen well since 1604.25 Although it was outside our galaxy, estimated to be 160,000 light-years away, “a 100-fold spike in the neutrino counting rate, a peak never seen before or after”26 was discovered by detectors both in the Japanese Alps and in a salt mine under the shore of Lake Erie. Thus, neutrinos and other sub-atomic particles from nearby supernovas may have had an important effect on radioactive decay. The decay rate may not be certain, or everlastingly set, however, it appears to be consistent enough to be useful in the formula for C14 date estimates during historical times. Measuring the current levels of C14 in a specimen is—by far—the most precisely determinable of the four essential facts. With the advent of AMS technology,27 scientists can determine the current composition of a sample with an impressive level of precision. However, “AMS tends to be significantly more expensive than decay counting,”28 and the less-precise technique is often employed. Essential Fact #4: Has Anything Else Affected the Specimen’s C14 Content? This component of the formula is the most difficult to estimate due to the incalculable number of variables and unknowns. Contamination of some samples has been identified, leading scientists to take extra precautions in order to protect specimens. Testing the accuracy of this required fact is limited and subject to a huge array of possible assumptions. Where does Carbon-14 come from? collide with atoms in Earth’s atmosphere.31 C14 has the same chemical properties as C12 and C13 (stable isotopes of carbon),32 and any of the carbon isotopes can react with oxygen to form carbon dioxide, which enters plants “as a result of photosynthesis and by absorption through the roots.”33 Plants are eaten by animals, and living things on Earth become ever-so-slightly radioactive due to ingesting things containing C14. When something dies, it no longer assimilates C14, at least not by the means described above. If an artifact is preserved from physical decay and leaching of chemicals, radioactivity may be the sole means whereby it gradually loses its C14. Figure 3. Carbon-14 formation. Cosmic rays continually bombard the earth. When they strike atoms in the atmosphere, chain reactions occur, some of which result in free neutrons (n) that readily react with nitrogen-14 to form C14. To test the assumption, the rate that C14 forms in Earth’s atmosphere was estimated (based on measurements from various locations around the globe). This was compared with C14’s decay rate. The testing indicated that C14 is forming faster than it is decaying. A simple analogy may be helpful: Suppose water is steadily dripping into a large tub. As long as water drips in faster than it escapes, the water-level increases. If it reaches a point where the rate water is dripping in is matched by the rate it escapes, it is in a steady-state or equilibrium. Similarly, for C14 to be in a state of equilibrium, its formation rate would need to be matched by its decay rate. Figure 4. A buildup curve contrasted with the assumed constant level. The curved line going up from 0% represents a rough estimate of the C14 levels in the atmosphere over the past 12,000 years or so. 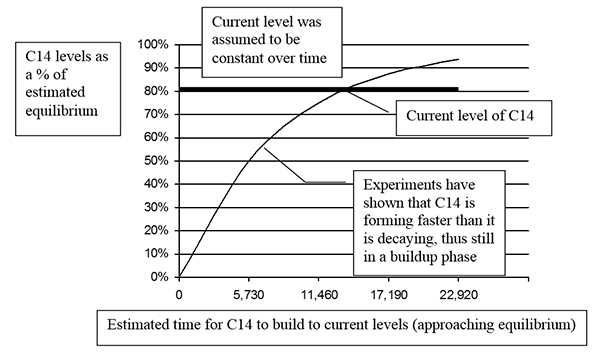 It is based on the 30,000 years Libby suggested was needed for C14 to build to a level close to equilibrium. The bold horizontal line represents the popular assumption that levels have remained constant over at least the past 12,000 years and are expected to remain the same in the future. Since current levels are about 80% of the equilibrium as calculated from the difference between the formation and decay rates, the line is drawn at 80% rather than the 100% used in figures 1 and 2. It seems an odd twist of logic to ignore the strong experimental evidence, and instead assume that C14 levels have been constant for many thousands, if not millions of years! Are there any compelling reasons to continue to assume what appears to be erroneous? There is one that is very persuasive: if C14 has been building for thousands of years, the assumption of uniformity in the atmosphere is wrong, and the current concentration of C14 is not an acceptable estimate for the past levels. What a horrible thought for staunch uniformitarianists! Could this be the main reason most scientists ignore the evidence for non-equilibrium? Perhaps it is—but the most common cause is likely ignorance of these details. 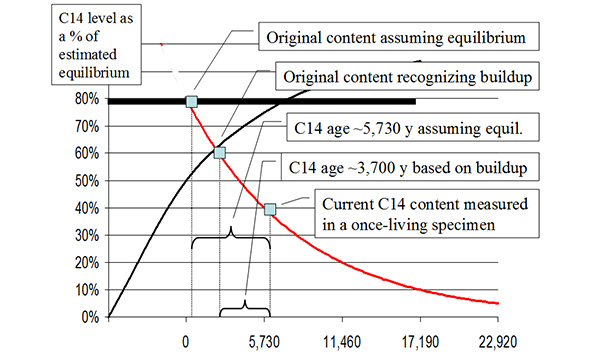 If C14 levels have, in fact, been building for say at least the past 4,000 years, the original C14 content in an ancient specimen would have been significantly less than current levels suggest. Therefore, failure to recognize buildup, causes the ages of specimens to appear older than they actually are, and it introduces a significant error into the first of the four components of the calculation formula! Would it be better not to buck the system and continue using an established—but invalid assumption? No. It appears that a re-vamping of the radiocarbon dating technique is needed. Since the C14 levels appear to be increasing, how does one correctly estimate the original content of a specimen? Using the difference between the formation rate and the decay rate, a buildup curve may be derived—as Cook has done.39 Simplified versions of his graphs are presented in Figures 4 and 5. Since then, evidence has been amassed showing that many of the “known historical dates” were wrong by a significant margin. Serious studies by chronologists have led to major revisions of the Egyptian dating (see chapter 9 of Science and Religion for some specifics). In the mean time scientists had adjusted the C14 system to fit erroneous Egyptian dates. It is ironic that since C14 dating was “corrected” (calibrated) to fit the older dates, it is now out of sync with the corrected historical dates. Paul Damon et al. wrote: “The key date for fixing the time the Egyptian Middle Kingdom and the periods preceding it is the seventh year of the reign of Pharaoh Sesostris III of the Twelfth Dynasty. This date is fixed by a heliacal rising42 of the star Sirius.”43 Although Damon referred to it as a “fixed” date, a number of contrary estimates for the age of this event have been claimed. I have collected thirty-two different dates from published sources attributed to the beginning of Sesostris III’s reign. They range from 1300 to 2099 BC. Nineteen of them were radiocarbon dates that range from 1300 to 1895 BC. This so-called fixed date is by no means certain. As carbon dating gained acceptance it was believed necessary to calibrate the results of the technique to agree with tree-ring dates.44 Pearson et al. suggested more than one calibration was needed.45 However, calibration has led to dates substantially older than those from uncalibrated C14 date estimates. Certain other watery environments can cause the carbon levels of some samples to contain diluted amounts of C14, depending on the nature of the source of the water.54 A specific instance was mentioned by Libby: “It has recently been shown that a New England lake whose bed was entirely ancient limestone and which was fed mainly by water leached through ancient limestone . . . whose radiocarbon content was only 77 ± 2 per cent of the value for the carbon in modern wood.”55 Thus something living in that lake would have a C14 content only about 77% of expected, and an uncorrected radiocarbon “age” of about 2,200 years. “The same standard techniques are too frequently used in ignorance to combine the results of determinations of dissimilar events or materials (e.g. heartwood charcoal and animal bone). Such combinations give an unjustified air of precision to a date, and they disguise real uncertainty.”. . . Discussions concerning the reliability of 14C-based age determinations on bone have occurred throughout all four decades of radiocarbon research. . . . Despite the amount of attention given . . . a tradition of skepticism concerning the general reliability of bone 14C values remains. . . .
From the point of view of the archaeologist or paleoanthropologist, this is an unfortunate situation, since bone material is present in many sites where other organics are not. . . . In other words, since bones can absorb minerals containing carbon through soil and groundwater, their C14 content can be altered—causing “dates” to appear younger, or older, than the actual age of the bone. Can other materials be similarly affected by chemical exchange? Although most of the geologic dating procedures are used to estimate ages believed to be much older than the C14 dating, one that is claimed to overlap is the Uranium-Thorium (U-Th) method. Unfortunately, the results have not been consistent. For things that lived more than 9,000 years ago, according to Bard et al., “the 14C ages are systematically younger than the U-Th ages, with a maximum difference of ~3,500 yr at ~20,000 yr BP.” They then suggested that the Uranium-Thorium technique can be used to calibrate carbon dating beyond the realm of tree-ring calibrations.61 Here is another example where, a different dating method produced older age estimations than C14, and it was assumed that the C14 method was less accurate. What causes people to suppose that less-testable methods such as U-Th, and K-Ar, are more accurate than the C14? Could it be the preference for “older” dates? What historical dates can be used to check their validity? There are none. Wouldn’t it be more logical to first fix the C14 system for known problems, and then use it to calibrate the other overlapping methods? Every radiocarbon age has an associated error term of which a major component is the counting error of the radioactive measurement process. . . . The quoted error terms are estimated in different ways by different laboratories. . . . Although only taking into account a small portion of the many uncertainties, scientists are at least recognizing that the stated precisions (±) are not to be relied on.67 Pearson, Pilcher, and Baillie noted: “The error associated with the 14C date, ie, the precision quoted . . . should include all inaccuracies, the error in the calibration, the choice of sample material and knowledge of the growth period.”68 Although they only listed three out of the large number of factors which can contribute to inaccuracy, they were on the right track. Scientists presumably do not use this terminology to deliberately mislead readers, nevertheless laymen and scientists who haven’t studied the details can, in fact, be misled. I remember being intimidated by such terms in my early chronology studies, particularly when a date I was working on was outside the claimed precision range of a corresponding carbon date, or an “absolute date” contrary to my findings—not so now. Despite its weaknesses, radiocarbon is a valuable tool for estimating dates of once-living things—as long as people realize that it produces only estimates, not precisely accurate dates. Although the errors increase with the actual age of the specimen, dates of things that died after about 2000 BC are usually close enough to be useful. Earlier dates appear to be grossly inaccurate and should be “put on the shelf.” Until more facts are built into the estimation formula and the known problems are corrected, the inaccuracies will persist. The C14 dating technique would be much better if many of the so-called corrections made in the past, which were based on faulty information, were abandoned. Then revisions could be made to account for non-equilibrium and other known effects. Dates prior to about 4,000 BC (the time usually attributed to Adam) should be considered spurious (to those of us who believe that the fall of Adam introduced profound physical changes into the world). “We know that the area was first inhabited around 500,000 B.C.” How is this known? This statement cannot be based on carbon dates since realistic estimates only claim theoretical ages up to about 40,000 years. On what then was it based? Particularly, what assumptions? Wouldn’t it have been more accurate to say something like: “The . . . [naming the estimation method used] suggests that the area was first inhabited around 500,000 B.C.”? Yes it would! Was he concerned that such wording, though more accurate, would inspire a lack of confidence among his readers? “It is almost inconceivable that in the first 450,000 years of Egyptian civilization the only improvement was a better hand ax!” Almost inconceivable indeed! On what basis was this almost inconceivable idea conceived? Even after realizing that the C14 dating technique has been calibrated using tree-ring dating and indirectly conventional Egyptian chronology, some fail to recognize the significance. For example Paul Standring reported an odd position held by Baillie: “I believe the revisionists [of Egyptian chronology] are wrong because calibrated radiocarbon dates broadly support the conventional Egyptian chronology. For the revisionists to be correct, calibration and dendrochronology would have to be wrong and that is not possible [sic] given the degree of tree-ring replication.”72 If one method has been adjusted to fit the other because the other was thought to be more accurate, then when they agree, it is merely a tautology.73 Another question has been raised: had Libby—earlier in his studies—openly acknowledged that the formation rate of C14 was significantly higher than its decay rate as experiments have shown, what would have been the ramifications? Had he done so, his system would have directly challenged the fundamental assumption of uniformity. Would it then have been the means of his receiving a Nobel Prize, which it was, or might he have been ostracized and labeled a pseudo-scientist like many others who challenged popular thinking? Once the deficiencies in C14 dating are recognized, the conflicts between radiocarbon dates and those from the scriptures are reconcilable. However, a resolution of the problem is a challenge for scientists who ask the out-of-the-ordinary questions and dare to pursue the answers. Dr. Melvin A. Cook proposed that higher levels of C14 in the biosphere since the Flood contributed to a significant decrease in human lifespans. To understand the ramifications, recall that carbon is a primary building block of life on Earth. Although radioactive carbon (C14) is only estimated to be .00000000010% of the total of naturally occurring carbon,74 like other radioactive elements, the decay process can damage living cells. Life forms apparently do not distinguish C14 from C12 or C13. As they assimilate carbon in the growth process, they do so in the same proportion it is found among other isotopes of available carbon. At some time in Earth’s history, a vast portion of the total carbon in the biosphere was “locked out.” That is, it was removed from the reach of living things by burial. The vast coal, oil, natural gas, limestone, and similar deposits composed of once-living matter that lie beneath the surface of the earth attest to that fact. Although there is no dispute that vast quantities of carbon were removed from the biosphere, there is ongoing debate about whether that burial was slow or sudden. It has been proposed that the carbon was locked out suddenly in conjunction with the Flood/continental shift event. Before the carbon was buried, there was a substantially larger amount of total carbon available for living things to assimilate at or near Earth’s surface. Thus, C14 was much more dilute, having been mixed with a much larger carbon pool at that time. So prior to the great Flood, as living things ingested carbon, they did so at a significantly lower dose of radioactivity. To understand, an analogy may be helpful: Picture a large aquarium filled with non-radioactive carbon atoms (C12 and C13). Imagine that carbon has the appearance and properties of clear water. Now suppose that C14 atoms also have the properties of water, but are a very dark-purple color, and toxic. Then, an apparatus starts to drip the dark purple C14 atoms into the aquarium at a rate of one drop each hour. Because the dark purple fluid would dissipate throughout, it would take quite some time before the clear water-like substance would start to discolor. Now suppose that half of the mixture in the aquarium is suddenly removed and buried. Immediately after removal, the remaining half would have the same concentration as before, but as the drops of the radioactive C14 continue to be added each hour, the mix continues to discolor. Since no more C12 or C13 atoms are added, and since the C14 is dispersing amidst a smaller volume of carbon, its concentration increases at a faster rate. absorbing carbon did so from a mixture much less concentrated in C14. After the Flood, anything obtaining carbon from the reservoir (which was increasing in C14 concentration more rapidly), would have receive a higher dose of radioactive carbon. If the continents did slide suddenly, there is no doubt that some things would have subducted (or been buried) beneath other parts of the crust. Although the common tectonic theory is generally associated with the assumption of slow continental movement, if its timing is modified, it seems to fit with the flood hypothesis proposed earlier in this book. Ham et al. summed up the idea quite nicely: “The Genesis flood would have greatly upset the carbon balance. The Flood buried a huge amount of carbon, which became coal, oil, etc., lowering the total [carbon]… in the biosphere.… Whereas no terrestrial process generates any more 12C, 14C is continually being produced.… Therefore the 14C/12C ratio in plants/animals/the atmosphere before the flood had to be lower.”75 Since radioactivity damages living cells and can cause cancer and other diseases, if radioactive C14 really has been increasing in concentration since the Flood, the higher levels of C14 in humans would naturally decrease longevity. See Cook. Scientific Prehistory. 1993, p. 11. This is a simplified version of his Figure 2-1. The information in this article is based primarily on the writings of Dr. Melvin A. Cook, and his sources. This is a simplified version intended to be understandable to non-scientists. Higham, Thomas “Radiocarbon Web-info.” http://www.c14dating.com/int.html, p. 1. Baillie, M.G.L. Tree-Ring Dating and Archaeology. 1982, p. 223. Hedges and Gowlett. “Radiocarbon Dating by AMS.” Scientific American, Jan. 1986, p. 100. Pipkin. Geology and the Environment. 1994, p. 36. Aitchison and Scott. “A Review of Calibrating.” In Applications of Tree-Ring Studies. 1987, p. 188. Säve-Söderbergh and Olsson. “C14 Dating and Egyptian Chronology.” In Proceedings of 12th Nobel Symposium. 1970, p. 35. Notes and Queries. “Tutankhamun radiocarbon dates.” C&C Review. SIS, 1996:1, p. 34. Libby. “Accuracy of Radiocarbon Dates.” Science, Vol. 140, no. 3564, April 19, 1963, p. 278. Otlet. “Impact of Atmospheric Carbon-14.” In Radiocarbon after Four Decades. 1992, p. 529. See Cook. Scientific Prehistory. 1993, pp. 10-22. Arnold. “Early Years with Libby at Chicago.” In Radiocarbon after Four Decades. 1992, p. 3. Libby. “Accuracy of Radiocarbon Dates.” Science, April 19, 1963, p. 278. CRC Handbook of Chemistry and Physics, 72nd ed. 1991, p. 11.29. Ramsey. “Radiocarbon Dating.” Archaeometry, Vol. 50, #2, 2008, p. 9. Beal. “A Bit Creaky?” C&C Review. SIS, 1991, p. 40. Rankama. Isotope Geology. 1954, p. 63. Monitor. “Radioactivity declines with temperature.” C&C Workshop. SIS, 1994:2, p. 30. Dalrymple. The Age of the Earth. 1991, p. 89. Curie. Radioactive Substances. Reprint edition 1971, p. 6. Jueneman. “Will the Real Monster Please Stand Up.” Industrial Research, Sept., 1972, p. 15. Pease. “Supernova Brightens the Horizon.” Nature, April 15, 1993, p. 585. Morrison, “Wonders: On Neutrino Astronomy.” Scientific American, Nov. 1995, p. 108. AMS: Accelerator Mass Spectrometry. A highly sophisticated scientific technique designed to measure different elements, and even to distinguish their rare isotopes. Of particular interest is its ability to identify quantities of the rare C14 relative to the abundant C12, and do so using smaller amounts of sample material. Rafter Radiocarbon Laboratory GNS Science. http://www.gns.cri.nz/Home/Services/Laboratories-Facilities/Rafter-Radiocarbon-Laboratory/Measuring-Radiocarbon/Accelerator-Mass-Spectrometry. There are several isotopes of carbon, with C12 being the most abundant (98.90%), C13 next at (1.10%), CRC Handbook of Chemistry and Physics, 72nd ed. 1991, p. 11.29. Radioactive C14 is less than 0.0000000001% of total carbon on the earth, Higham. “Radiocarbon Web-info.” http://www.c14dating.com/int.html, p. 2. Nitrogen-14 is the most abundant element in Earth’s atmosphere, about 78% by volume. CRC Handbook of Chemistry and Physics, 72nd ed. 1991, p. 4.19. Cosmic rays are high-energy nuclear particles which continuously bombard the earth from all directions. CRC Handbook of Chemistry and Physics. 1991, p. 11.133. Cosmic rays travel at nearly the speed of light. These collisions cause cascades of secondary nuclear particles, some of which are free neutrons. McGraw-Hill Concise Encyclopedia of Science. 1997, pp. 501, 1289-1290. Faure. Principles of Isotope Geology. 1977, p. 307. Libby. Radiocarbon Dating, 2nd Ed. 1955, pp. 8-9. Libby. “Radiocarbon Dating.” Science, March 3, 1961, p. 622. Lingenfelter. 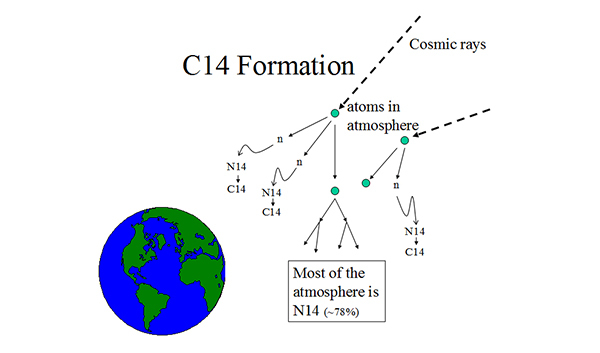 “Production of Carbon 14 by Cosmic-Ray Neutrons.” Reviews of Geophysics. 1963, p. 51. Ramsey. “Radiocarbon Dating.” Archaeometry, Vol. 50, #2, 2008, pp. 5, 9. Cook. Scientific Prehistory. 1993, p. 11. Cook. The Autobiography of Melvin A. Cook. Vol. 2. 1977, p. 72. Libby. “Natural Radiocarbon and Tritium.” In Radiocarbon and Dating. 1965, p. 749. Heliacal: of or near the sun; the apparent rising, or setting, of a star or planet just after conjunction with the sun. Webster’s College Dictionary, 4th ed. 2005. Damon et al. “Fluctuation of Atmospheric C14.” In Radiocarbon and Dating. June 7-11, 1965, p. 417. Becker. “History of Radiocarbon Calibration.” In Radiocarbon after Four Decades. 1992, pp. 34-48. Pearson, Pilcher, and Baillie. “High-Precision 14C Measurement.” Radiocarbon, Vol. 25, 1983, p. 184. Porter. “Recent Developments in Archaeology.” C&C Review. SIS, 2002:1, p. 14. Newgrosh. “Calibrated Radiocarbon.’” C&C Review. SIS, 1991, p. 37. Porter. “Ai, Jericho and ‘Deviant’ C14 Dates.” C&C Review. SIS, 1992, p. 26. Libby. “Natural Radiocarbon and Tritium.” In Radiocarbon and Dating. 1965, p. 747. Goodfriend and Hood. “Carbon Isotope Analysis.” Radiocarbon, Vol. 25, No 3, 1983, p. 827. Shackleton et al. “Radiocarbon Age of Deep Water.” Nature, Oct. 20, 1988, p. 709. Keith and Anderson. “Radiocarbon: Fictitious Results.” Science, Vol. 141, no. 3581, 1963, p. 636. Hedges. “Sample Treatment in 14C Dating.” In Radiocarbon after Four Decades. 1992, p. 173. Libby. Radiocarbon Dating, 2nd Ed. 1955, p. 11. Keenan. “Why Early Radiocarbon Dates Downwind are Too Early.” Radiocarbon, Vo. 44, #1, 2002, p. 232. Van der Merwe. Carbon-14 Dating of Iron. 1969, p. 66. The inner rings are the oldest while the outer rings are the most recently grown. Lasken. “Misusing Radiocarbon.” C&C Review. SIS, 1992, pp. 17-18. Taylor. “Radiocarbon Dating of Bone.” In Radiocarbon after Four Decades. 1992, pp. 375, 377. Bard et al. “Calibration of the 14C Timescale.” Nature. May 31, 1990, p. 405. Judson and Kauffman. Physical Geology, 8th ed. 1990, p. 3. Absolute time. McGraw-Hill Dictionary of Scientific and Technical Terms. 1974. Roth. “Dating Using Radioactive Phenomena.” In Nuclear Methods of Dating. 1989, p. 4. Aitchison and Scott. “A Review of Calibrating.” In Applications of Tree-Ring. 1987, pp. 188-189. Pearson, Pilcher, and Baillie. “High-Precision 14C Measurement.” Radiocarbon, 1983, p. 184. Newgrosh. “Scientific Dating Methods.” Journal of the Ancient Chronology Forum, Vol. 2, 1988, p. 67. Ramsey. “Radiocarbon Dating.” Archaeometry, Vol. 50, #2, 2008, p. 28. Brier. Ancient Egyptian Magic. 1981, p. 14. Standring. “Pot Pourri.” C&C Review. SIS, 2001:2, p. 50. Tautology: a needless repetition of an idea. Often, the restated version is intended to establish the validity of the first, or visa versa. Higham. “Radiocarbon Web-info.” http://www.c14dating.com/int.html, (last accessed 9/4/12). Additional data that wasn’t considered in the article.